You’re probably familiar with microdermabrasion as a way to improve your skin’s texture and appearance. I regularly use microdermabrasion products 3 times a week — but you shouldn’t do it more than that. One of the latest techniques to improve your skin is called derma rolling (or micro needling), which boosts your skin’s production of collagen. I use a derma roller on days that I’m not using microdermabrasion products. 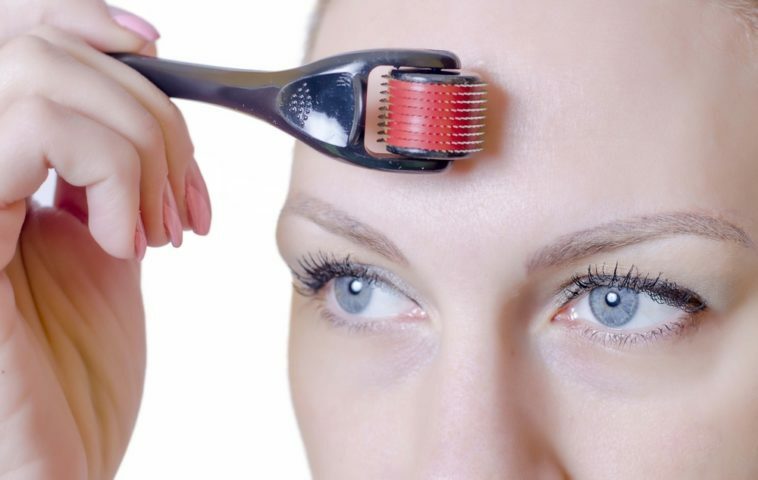 A derma roller looks like a very small paint roller that’s covered in lots of small metal pins — which you roll over the areas of your skin that you want to improve. The pins make many small punctures in the outer layer of your skin (the dermis) — which forces the skin to grow new cells. It’s safe. But less is more. Generally, product instructions (and even some health & beauty experts) claim that using a derma roller once a day — or every other day — is safe. While it may be safe, it’s probably not the best thing for your skin to use it that frequently. Dr. Orden says that micro needling is a something that is safe and good for your skin. He recommends that you use a derma roller regularly, in order to continuously see good results. She speaks a bit more highly of derma stamps and derma pens — primarily because there is more research proving their effectiveness at this time. The pins or needles on a derma roller are usually made of stainless steel or titanium and come in different lengths. Wondering which size pins to choose when you’re buying a derma roller? To treat fine wrinkles, a needle length no greater than 1.5 should be used. To break down scar tissue, use 1.5 mm needles. Acne scars can be treated with 1.0 mm needles. To improve sun-damaged skin or to even out skin pigmentation, use needles that range between 1.0 mm to 1.5 mm in length. How Long Until You See Results After Dermarolling? Right after you use a derma roller, your skin will probably look red and irritated, so you should use it before bed. You should begin to see your skin improving after only a few uses. For best results, most (even Dr. Orden in the video above) say you should use the derma roller every day — or at least every other day. But, to be honest, I only use it on days that I’m not already using some other form of microdermabrasion on my skin — because I just don’t want to abuse my skin. And I agree with Paul Begoun (above) on the way collagen works to “heal” skin issues. If your skin is constantly in hyper-repair mode due to constant injury from the derma roller needles, then it may start to look stiff and unhealthy if you use a derma roller too frequently. It’s critically important to use an antiseptic spray or other disinfectant on the entire roller head and needles after you use it to properly sterilize it and avoid an infection. Also, don’t share a derma roller with anyone else! You may want to apply a numbing cream before using the derma roller to dull the sensation you may feel while using the roller. For most people (myself included), the tingling feeling isn’t an issue though. Using a derma roller before applying skin care products can enhance the penetration of those products (they will be absorbed more effectively and more deeply into your skin). So you may want to apply a topical product immediately after using the derma roller to speed up the process of cell renewal. That’s my favorite way to use the derma roller — to increase the penetration and effectiveness of healthy skin products. And I always try to keep my skin super-moisturized after dermarolling. So it’s a win-win for my skin.